POLITICAL TIDBITS: We mourn the destruction of Marawi City, but at least it’s young and history still to be written---unlike in ancient Iraq and Syria, with wrecked cities like Palmyra, the “Venice of the Sands,” whose precious relics of civilization are being destroyed wantonly. As a prominent cultural anthropologist put it: "Heritage, like human life, is irreplaceable." We mourn the destruction of Marawi City, but at least it’s young and history still to be written---unlike in ancient Iraq and Syria, with wrecked cities like Palmyra, the “Venice of the Sands,” whose precious relics of civilization are being destroyed wantonly. As a prominent cultural anthropologist put it: "Heritage, like human life, is irreplaceable." 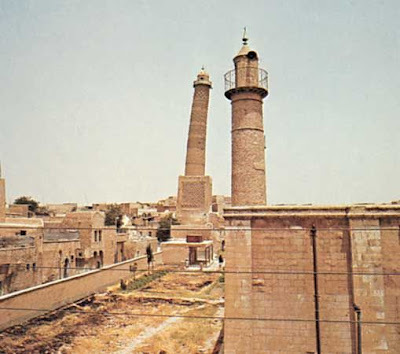 The historic and symbolic grand al-anuri Mosque in Iraq's second largest city of Mosul, together with the Pisa-like Minaret at left. After ISIS burned down the Mosque last Wednesday night, the 840-year old Minaret stands by its lonesome. Colonnade ruins in the ancient city of Palmyra, Syria's second largest, which was savagely destroyed by war between ISIS and government forces. 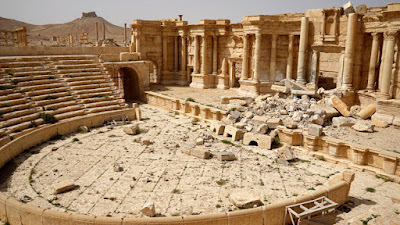 The Roman Theater in Palmyra where government forces celebrated re-capture of the city, destroyed by ISIS forces..After its recapture, the Russian forces brought in the Mariinsky Philharmonic Orchestra from St. Petersburg to play at this theater, even though it is very badly damaged, as photo shows. Five weeks into the fighting in Marawi between government forces and IS-allied Maute rebels, our most beautiful Muslim city that lies on the banks of Lake Lanao is in total ruins---just like in epic war movies. Its destruction is the kind one cannot adequately put a price tag on, nor fashion a timetable on how long it would take to restore and rehabilitate---or to heal the trauma its people have undergone in these five horrifying weeks. Destroyed were the Catholic Cathedral and its statuary, beautiful mosques, the Protestant-run Dansalan Colleges, parts of the city hospital and countless homes and buildings that were bombed for suspected hidden terrorists. But what should comfort us at least is that Marawi is a young country in terms of history and cultural artifacts, compared to the Middle and Near East---ancient countries like Iraq and Syria that have been bombarded and ransacked heavily in recent times, their populations scattered with terrible trauma, AND PRICELESS ANTIQUITIES, SOME DATING BACK TO THE DAWN OF RECORDED HISTORY, NOW DAMAGED BEYOND REPAIR. 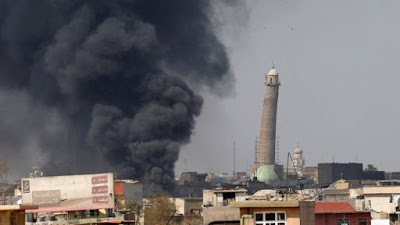 Take the recent blowing up by Islamic State rebels of the historic mosque in Mosul, Iraq’s second largest city, which government forces are trying to wrest back from the IS. The symbolic Grand al-Nuri Mosque in that town was blown up by IS forces as government troops were advancing---ironically. on the holiest night of the year for Muslims, the Laylat al-Qadr, which commemorates the revelation of the Koran to Prophet Muhammad.. Luckily, the al-Hadba leaning minaret right next to the Mosque, which is 840 years old and often compared to the Leaning Tower of Pisa in Italy, was spared and now standing by its lonesome. This ancient Mosque just blown up was where, in the summer of 2014, IS leader Abu Bakr al-Baghdadi “ascended a pulpit and declared a caliphate after his fighters took control of Mosul and swept through other parts of northern Iraq and Syria.” This edifice and its leaning minaret have dominated the Mosul skyline for centuries and in fact this landscape is even featured in Iraq’s currency (the 10,000 dinar). So many other ancient cities in this part of the world were destroyed and plundered by the IS, among them Simla Havoc and Nimrud in Iraq as well as Samarra and Hatra. The Syrian city of Tadmir was likewise plundered. 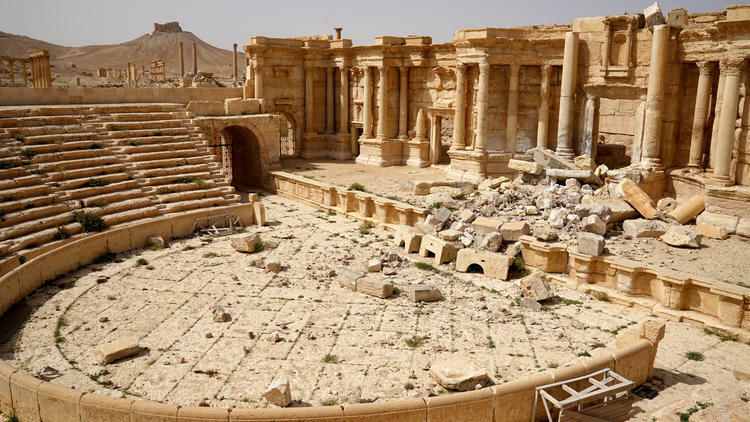 But perhaps the most heartbreaking of all was the destruction of the ancient city of Palmyra, Syria’s second largest city---which probably has few rivals in its tragic cultural fate amid the seesawing battle between government forces and the IS over the past two years. Palmyra, declared by UNESCO since 1980 as a World Heritage Site, was an ancient oasis city with lavish gardens, 20 varieties of date palms and monumental white limestone buildings---one of the best-maintained complexes of antiquity. Known popularly as the “Venice of the Sands,” Palmyra also came to be recognized as the “historic city,” as it was the former capital of the legendary rebel warrior queen Zenobia (240-275 A.D.). Prior to the destruction of Palmyra starting in 2011, historic accounts sang paeans of praise for this city because of its oasis setting and well-preserved architectural mix of ancient Semitic, Roman, Greek and Persian motifs. Experts pointed out that this ancient city was a favorite watering-hole of traveling caravans since the beginning of time. Thus, "it stood at the crossroads of several civilizations (and) married Graeco-Roman techniques with local tradition and Persian influences.” Palmyra would lure more than 150,0000 tourists a year. To us Christians, Syria is particularly significant---and second only to Jerusalem in importance. Recall that the Lord had ordered the pagan Paul, whom He blinded for a while, to journey to Damascus and look for Ananias who was to restore his sight. Moreover, the Sermon on the Mount was delivered by Jesus Christ in Mt. Hermon, said at that time to be in Syria, while the Transfiguration occurred there too. Antioch, the ancient Roman capital in the Middle East, was where the disciples of Jesus were first termed “Christians.” It was also said to be the starting point for the ministry of Apostle Paul, Barnabas, Luke, Mark and others, who were all to suffer persecution and martyrdom. Thus, it is said that the blood of the martyrs became the seed of the Church, and much of it sprouted out of Syria. 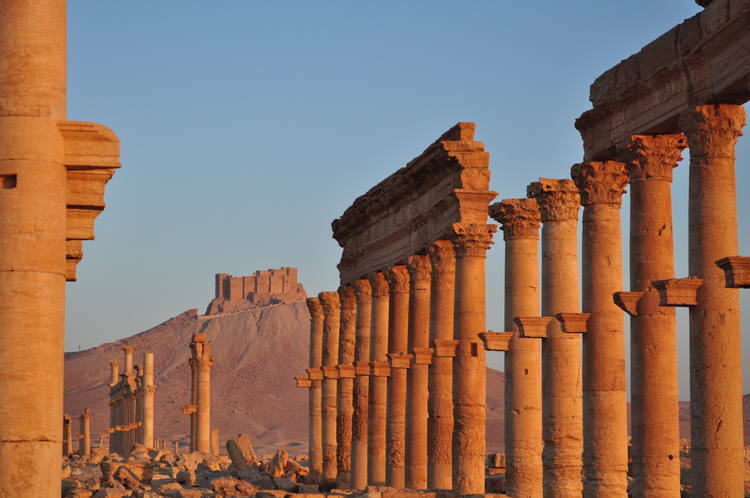 World pressure on the IS led to its oath that while “IS will break the idols that the infidels used for worship,” it would not touch the historic buildings erected between the first and third centuries, nor the antiquities. 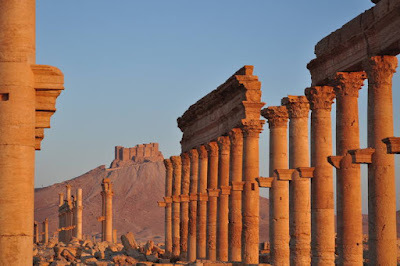 But destroy Palmyra the IS did, beginning with three tower tombs dating from the 1st to the 3rd centuries---in what had seemed like a systematic on-going eradication of pre-Islamic structures undertaken by IS since mid-August of last year. Early last September, the rebels blew up the Mesopotamian Tempel of Bel, described by Ross Burns, an ancient history professor of Australia’s McQuarie University as “the most significant building in Syria from the Roman period" (roughly 63B.C. to 500 A.D.). This was followed by the destruction of the Phoenician Temple of Baal Shanim, Palmyra’s second most important religious shrine---a terrible feat termed by experts as analogous to the “Stone Age Communism” of the Khmer Rouge in Cambodia in 1975-1979. In 2001, the Taliban and Al-Qaeda destroyed famous Buddhas of Amiyan in Afghanistan. Then significantly, what IS did not destroy, it looted and sold through a “highly methodical, highly efficient excavation operation to finance its twisted ambitions,” as US Deputy Secretary of State Anthony J. Blinken put it. So what can be done about all the horrible destruction of irreplaceable antiquities? It had been pointed out that the Mali, Africa-born citizen Ahmad Al Mahdi Al Faqi, a member of a militant Islamic group and deported from Niger, was to stand trial before the International Criminal Court (ICC) in The Hague, for the “war crime of the intentional destruction of historic monuments and buildings in Timbuktu (Africa) in 2012". The suit against this Mali citizen was to be the first of its kind to be brought to the ICC. The world should keenly watch how far this "war crime" of destruction of antiquities before the ICC would go.